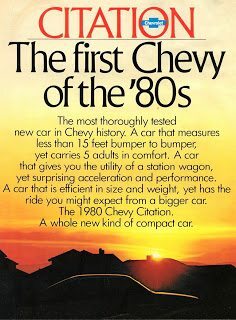 They called it the first Chevy of the 80’s. That statement is easy to understand but shockingly confusing. I mean; I’m my family’s first child of the 80’s, but that alone does absolutely nothing to make me great. “Ooooh, the 80’s – you were first?” Nobody ever said that to me. 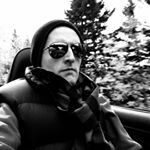 Yet that was part of General Motors’ marketing philosophy for the highly-acclaimed Chevrolet Citation. Highly acclaimed? Indeed it was… at first. The advertisement you see below also makes much of the Citation’s tidy size, carrying capacity, and surprising performance. With reason, my friends. With reason. The 2.8L V6 under the hood of that blue Citation generated 130 horsepower, just 10 down on his Civic sedan. Oh, but what torque; 155 lb-ft of twist. That’s 27 lb-ft above and beyond the (much smaller-engined) Civic. Yes, the Civic gives away two cylinders and 1 litre of capacity, but I’m starting to wonder if Chevrolet was onto something. “A whole new kind of compact car”, they said in the 1980 ad. However, continuing the comparison between new Civic and ’85 Citation reveals some Chevy negatives. The Honda’s ability to top 30mpg by Fueleconomy.gov’s standards engender some disgust with the 18mpg of the old Chevrolet. Suddenly it seems that the $400 Citation you’ve seen in the local classifieds is…. not so cheap after all. Then again, the ’85 Citation was ahead of its time. No, really. Not only was the Citation a perfect car when the passing lane opened up, it was also the perfect car for -20C weather. Don’t count that to the credit of impeccable weather sealing. Keyless-go and push-button starting are no 21st century inventions. Give me a break. That ’85 Chevrolet Citation was equipped with Keyless Continuation. If you look through the old brochures or Chevrolet.com circa 1985, you won’t find Keyless Continuation, but it was brilliant. The glovebox necessitated the ignition key to gain entry. No need for a second key to access the glovebox though. Keyless Continuation permits the safe passage of the key out of the ignition without turning off the car. Wow.